Note: This article basically spoils the entirety of Jordan Peele's Us -- proceed at your own risk. For a spoiler-free review, head this way. Hands Across America was a nice idea, in theory. On a single day in 1986 -- Sunday, May 25, 1986, to be exact -- regular Americans, human celebrities, and even Mickey Mouse and Chewbacca would join hands and form a link across the nation in an effort to raise money and awareness for hunger and homelessness charities. But there was always something disconcertingly optimistic about this show of solidarity, and the hypocrisies have only mounted as time has gone by. Jordan Peele has recognized this. The bizarre event is the key to his new horror movie Us, both as the cultural touchstone at the center of the narrative and the inspiration for all the misdeeds that take place during it. Peele wants us to consider that image of Americans holding hands in an unbroken line across the land as something truly terrifying. The ultimate goal of Hands Across America was simple: People from all walks of life would link hands and form a human chain stretching the length of the entire country for 15 minutes. Each person taking part would be asked to donate at least $10 toward the ultimate goal of raising $50 million. There would be sing-alongs to "We Are the World" -- the supergroup ballad that came out a year earlier, raised $53 million, and served as inspiration for the project -- and "America the Beautiful." All participants would stand together in a physical show unity. The treacly pop-rock theme song -- titled, of course, "Hands Across America" -- was performed in part by the band Toto. The music video, released ahead of the chain formation date to wrench hearts and encourage participation, dripped with '80s cheese, mixing sad-looking children with smiling celebrities. Don Johnson and Philip Michael Thomas lip-synced in full Miami Vice regalia. Robin Williams joked around with C-3PO. Barbra Streisand appeared, as did Glenn Close, Lily Tomlin, Yoko Ono, Andy Warhol, Mikhail Baryshnikov, Jeff Bridges, Oprah Winfrey, Kevin Bacon, and so many more in its five minutes. But the endeavor, as well-intentioned as it might have been, was plagued by issues almost from the outset. Not only was the single nowhere nearly as catchy as "We Are the World" -- though it will get stuck in your head -- it also drew the unfortunate participation of President Ronald Reagan the same week that he blamed the country's hunger problems on the poor, brainlessly claiming that no one "is going hungry in America simply by reason of denial or lack of ability to feed them," but because there was "a lack of knowledge on the part of the people as to what things are available." Hands Across America was also an extremely expensive stunt to mount, what with all the advertising and man power required to organize it. According to a New York Times report from the era, it cost somewhere between $14 and $16 million dollars; a more recent Mental Floss story pegs the ultimate price as $17 million. Only about $15 million was ultimately delivered to charities through grants, far short of the $50 million it advertised. "They spent too much to raise too little and promoted a national extravaganza empty of content," Robert Hayes, founder of the National Coalition for the Homeless, told the Times. And on top of all of that, there were holes in the line. That's where Peele comes in. He told UPROXX that his ideas for Us crystalized when he came across an MTV promo for Hands Across America -- a truly surreal jumble of eyes, fingers and hands -- on YouTube and felt "scared." He decided to open his new film with the younger version of Lupita Nyong'o's character, Adelaide Wilson, as she watches that commercial. 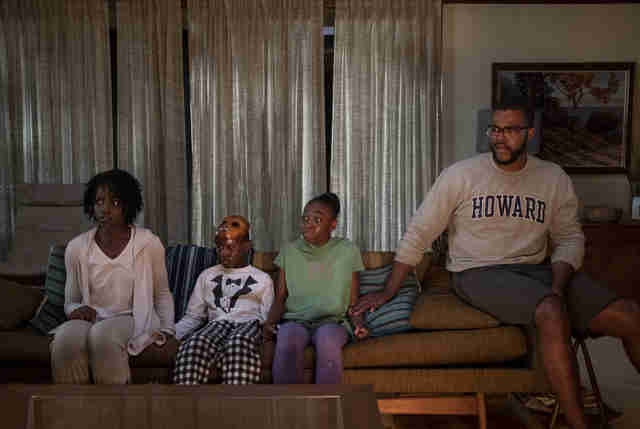 "It took me down this path to really think about this movie in terms of this country and the idea of demonstration or protest, or even performance art," Peele said. 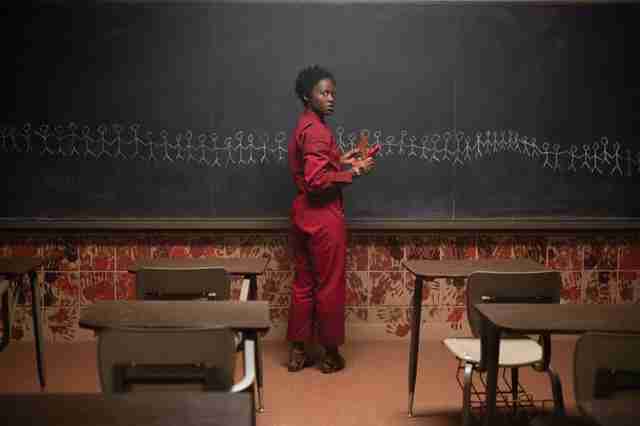 In Us, the grown-up Adelaide and her family are pursued by a doppelgänger named Red (also played by Nyong'o) and her familiar-looking family. These hunters, clothed in red jumpsuits and wielding scissors, are the "tethered," emerging from a life underground in the purported thousands of purportedly unused or abandoned tunnels below the entire United States. They have come to kill their above-ground twins, who feasted on warm food while they were forced to eat raw rabbit. During the final showdown between Adelaide and Red, the latter explains that the tethered were created as part of a government mind-control experiment, but they were left to rot when it turned out that the human body could be doubled but not the soul. When Red and Adelaide encountered one another as children in 1986, meeting in a boardwalk attraction full of funhouse mirrors, life changed for the tethered. Red was able to wake up her fellow "shadows" and mobilize them. She was inspired by the Hands Across America initiative, hanging a T-shirt with the logo as personal motivation in plain sight. Their weapons would be symbolic: Scissors are lethal but they can also make the kind of paper chains constructed in elementary school. The tethered would rise, kill their counterparts, and join hands spanning the nation. That plan is already well underway when Adelaide kills Red. In her final moments, the apparent villain's lips purse to whistle "Itsy Bitsy Spider" before her human reflection snaps her neck with the handcuffs she's been wearing since Red demanded she "tether herself" to her vacation home's coffee table. The song is a callback to the day they met in 1986. It's also a clue. Peele saves his final trick for the last moments. It was always assumed that Red was tethered from birth, just as Adelaide had grown up free. But that's not actually the case. It's the child version of Red we see above ground with Adelaide's parents. When they met in the funhouse mirror maze as children, Red chained up her twin in the tunnels and swapped places, reaping the rewards of a life in the light. It's not Adelaide who we see watching the MTV promo in those first frames; it's Red. That's where her mission began. It's a searing indictment of Hands Across America, which claimed that all Americans are just brothers and sisters wanting to help each other out. That wasn't the case then, and it certainly isn't now. Just think: As Hands Across America was failing to reach its goal, people around the country were dying of AIDS, a crisis the Reagan administration belittled. That same president popularized the racist notion of the "welfare queen," a nasty stereotype of black women that still haunts the political discourse, escalated the oppressive and still ongoing War on Drugs that has nearly exclusively targeted people of color, and operated under "trickle-down economics," which hoards wealth for the already wealthy. It's in this nation's nature to leave some behind, and in Us, those people are represented as the tethered. When Adelaide asks Red who they are, she responds: "We're Americans." Throughout Us, Peele homes in on class divides, big and small. Even before they are attacked, the Wilsons are in competition with their friends Kitty and Josh Tyler (Elisabeth Moss and Tim Heidecker). Adelaide's husband Gabe (Winston Duke) buys an older fishing boat to impress Josh, who has a bigger, fancier tugboat. Kitty, a two-time actress in commercials who swears she could have made it big if not for having children, gabs at a resistant Adelaide about facelifts and her constant quest to stay young while drinking rosé on the beach. The Wilsons have means, but not the means the Tylers have. But to the tethered, they are living extremely well. That last revelation about Adelaide's true nature is another layer of hypocrisy Peele adds to the pile. As a child, this woman climbed her way out of hell and refused to look back. Even now she relishes in her personal triumph over the ones she abandoned, locking eyes with her son and smiling just a bit. Here, no one is innocent. The desire to thrive in America makes monsters of us all.